Have you got a good memory? 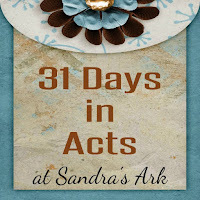 If you have been reading these 31 Days in Acts blog posts with me you should remember that we met a person called Barnabas before, in fact we met him twice. Which chapters did we meet him in? What does the name Barnabas mean? What is his other name? What did he do that meant he was already included by Luke in this book about the Apostles and the Work of the Holy Spirit? Do we need to know what role he had within the church? Yes because it is interesting to know the facts and relationships but no it's not necessary to know every little bit about a person. So far we do not see that he had a specific role as a leader or apostle or evangelist but he was able to vouch for Saul and have the other believers change their minds about Saul so they must have respected Barnabas. There is one thing I do think is important for us to know about him and that his name means the son of Encouragement (Acts ch. 4 v 36) and in the Bible a person's name is important and reflects the character - in other words it appears that he was an encourager in the church. This is a very important role in the church body as we all need encouragement and most people are so bad at encouraging each other. Verse 19 tells us that so far the believers, who had left Jerusalem due to persecution, had gone to many other places but were only telling other Jews the good news about Jesus. Now we saw in yesterday's blog post It's Not about Us, It's All about God that Peter was led to go and share with some Roman gentiles so obviously God did not mean that only Jews were to hear the Gospel. Now again here we see that now the news was spreading to further places and some Greeks were becoming believers. Barnabas is the one then chosen to go to Antioch to see what is happening there and we are told that he was glad to see what was happening and I think that meant he was also encouraged by this. 23 When he came and had seen the grace of God, he was glad, and encouraged them all that with purpose of heart they should continue with the Lord. 24 For he was a good man, full of the Holy Spirit and of faith. And a great many people were added to the Lord. What did Barnabas encourage them to do? To keep on walking with the Lord. Then we see that he stays in Antioch for a year to teach the people but not on his own because he goes to find Saul and bring him to Antioch with him. This may not only be encouragement for the believers in Antioch but also more encouragement for Saul as Barnabas shows his respect and confidence in him and also gives him the opportunity to teach and share his own experience. We often think of Saul as being the great writer and speaker but a lot of the confidence and ease of speaking to others comes with practice and gaining more knowledge too. A very well-know verse is found in in this passage where we are told that the believers were first called Christians in Antioch but maybe because of this we tend to forget about Barnabas and Saul working together and encouraging the believers. We would all benefit from having a friend like Barnabas who would encourage us and help us learn to be encouragers too. 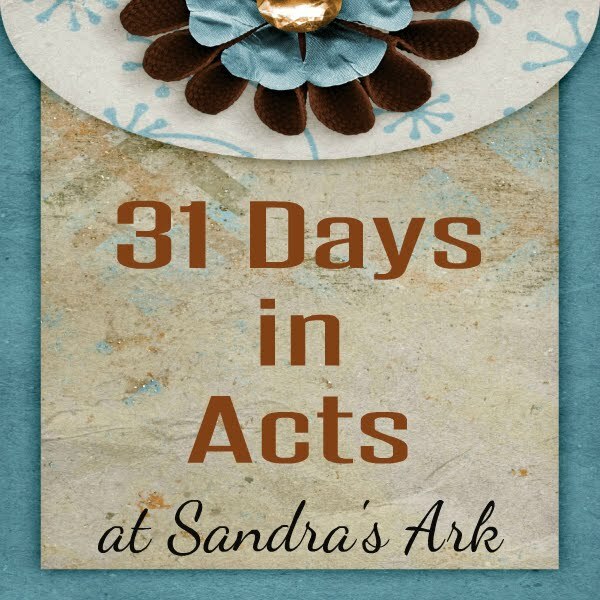 I'm trying to read and write about the Book of Acts for 31 Days so please come back and join me for some notes & some thoughts each day. Sandra, thanks for this post. It was very encouraging. So often we don't encourage one another and we should. We should take every opportunity to encourage, build up and be a friend to each other, there are too many wolves waiting to tear us apart and see us fail. 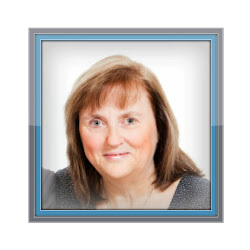 interesting post sandra:) encouragement is my favorite gift! Sandra, I was interested in dropping by your page today when I saw what the topic was. How uncanny that it was exactly what my lesson was for my adult bible study class. 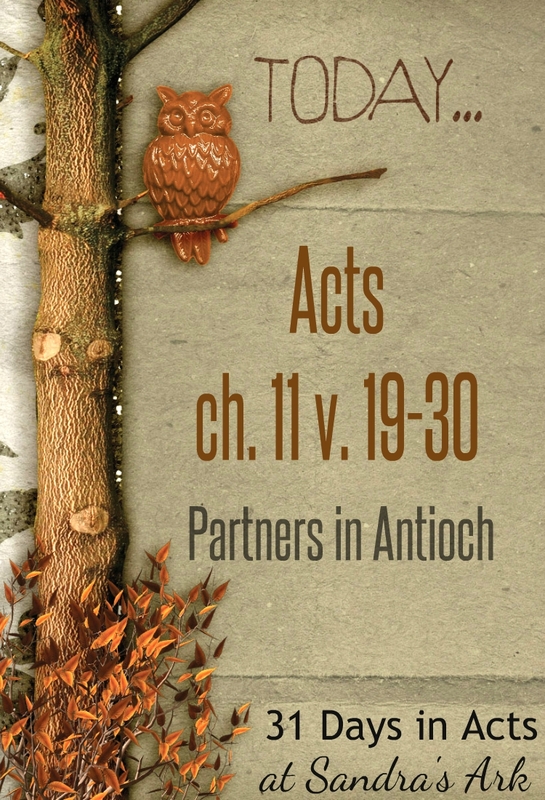 We are studying the book of Acts verse by verse and have worked our way up to chapter 11. I think it was so interesting that Barnabas took the time to go find Saul and bring him with him and give him an opportunity to do ministry. Such a time of mentoring! I would hope that all of us can be like a Barnabas to someone. We all need encouragement and to be lifted up. I needed to read your post today. I am struggling to be an encourager today. Thank you! I have a friend that is always an encourager for me. I really need to learn to be a better friend and encourager, as well. Thanks for sharing via the #LMMLinkup.